Get greens in all year long with this tasty (and also healthy) artichoke spinach dip! 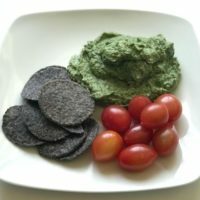 This dip is made with non-fat sour cream, making it a great lower fat alternative to other more traditional versions of this recipe. It will also provide you with some important vitamins, minerals, and phytochemicals. Here’s a breakdown of what you’ll get out of this tasty dip! Spinach is considered a nutrient dense food – it’s loaded with vitamins and minerals, while low in total calories. Mature spinach is tasty in soups and baby spinach is great in fresh salads or added to smoothies like in this purple smoothie bowl. Spinach is a good source of Vitamin A and folate, and an excellent source of Vitamin K: one cup of raw spinach gives you 161% of the dietary reference intake! Vitamin K is important for blood clotting and for maintaining the health of our bones and blood vessels. Spinach is also an excellent source of the lutein, an important phytochemical involved in maintaining eye health. Research indicates lutein may help decrease your risk of developing age-related macular degeneration. Lutein may also play a role in improving cognitive functioning. If it’s starting to sound like you should include more spinach or leafy greens in your diet –you’re right! Like their leafy green counterpart in this recipe, artichokes are also packed with important nutrients. Artichokes are also excellent sources of vitamin K, as well as folate and dietary fiber. One medium artichoke contains 10 g of fiber- that’s 41% of the dietary reference intake. Fiber is important for gut health, lowers inflammatory processes, aids in preventing constipation, and may also decrease your risk of developing type 2 diabetes and coronary artery disease. Artichokes are also considered good sources of copper, magnesium, phosphorus, vitamin C, riboflavin, and choline. Let’s not forget about garlic– and it’s not simply a flavorful addition! Garlic is loaded with organosulfur compounds, which may play a role in decreasing cholesterol and blood pressure. Organosulfur compounds in garlic may also decrease inflammatory pathways in your body, in addition to working as antioxidants. This dip is sure to be a hit at your next party! Defrost spinach for 4 minutes, then drain. Drain oil from artichokes but don’t rinse. Serving ideas: Pair with your favorite sliced veggies (try carrots, bell peppers, or cucumbers), whole grain crackers, blue corn chips, or a sliced whole grain baguette. This also tastes great warmed up as a vegetable side.